Team 2539 has had another fantastic weekend at the Springside Chestnut Hill event. For the 2nd time they were #1 Qualifier and #1 Alliance Captain. Those are great accomplishments, making their hard work, long hours and dedication rewarding. Alliance selections were very interesting this year. With defense becoming a large part of this year's game and the few robots left to choose from when making the final pick, it certainly has been a challenge. ​The Team started off with a rough day at the build site, but that was not enough to push the Team down. The Team arrived at the competition on Friday and unpacked quickly. The Team took straight to the practice field and began working on their robot's features and code. The Team worked hard, being prepared on all spare parts, batteries, and inspections. Qualification matches began on Saturday, and jumped straight into scouting and competing. The Krypton Cougars started off in Qualification match #5 and were allied blue with 708 and 2180. 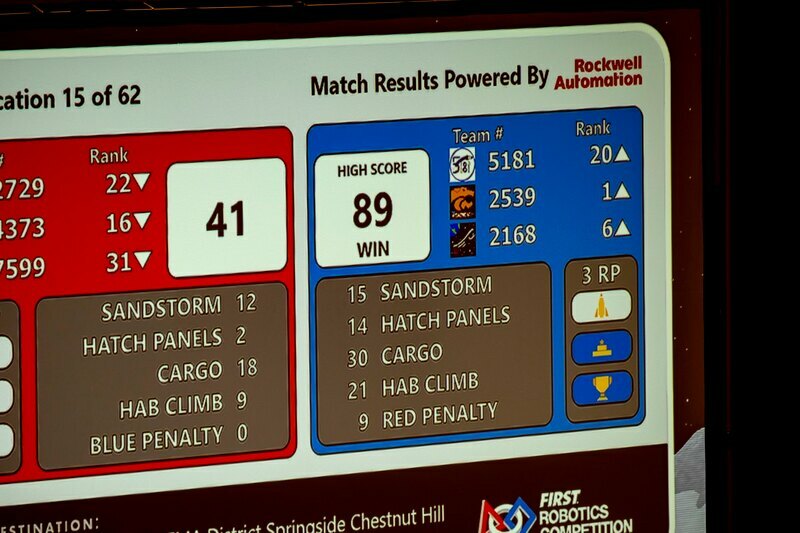 The match started out with all three robots gaining the sandstorm mode bonus, totaling up to a count of twelve points. The magnificent drive Team drove right to the rocket and began to score. Both alliances competing, the scores were climbing. 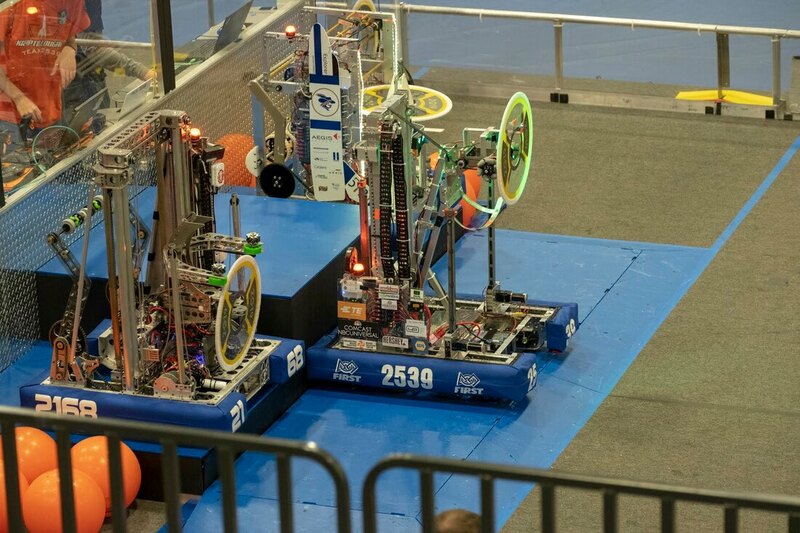 In the final moments of the match, Peggy (2539's robot) dashed to the HAB zone and began their third tier climb. The robot ascended and successfully touched down on the level. Scoring 12 points for the alliance in end game, they made their fans proud. At the end of the match, the blue alliance was declared victorious, 77-39. The Krypton Cougars went through three more matches with their back up operator, until the full-time operator arrived. By the end of Saturday, the Krypton Cougars had a match record of 7-1-0 and had come very close to filling a rocket. Sunday morning, the Team worked all through the first three hours of pit time to prepare their robot for a tough final day. The Team pushed through all 4 of their matches, finishing with 3-1. 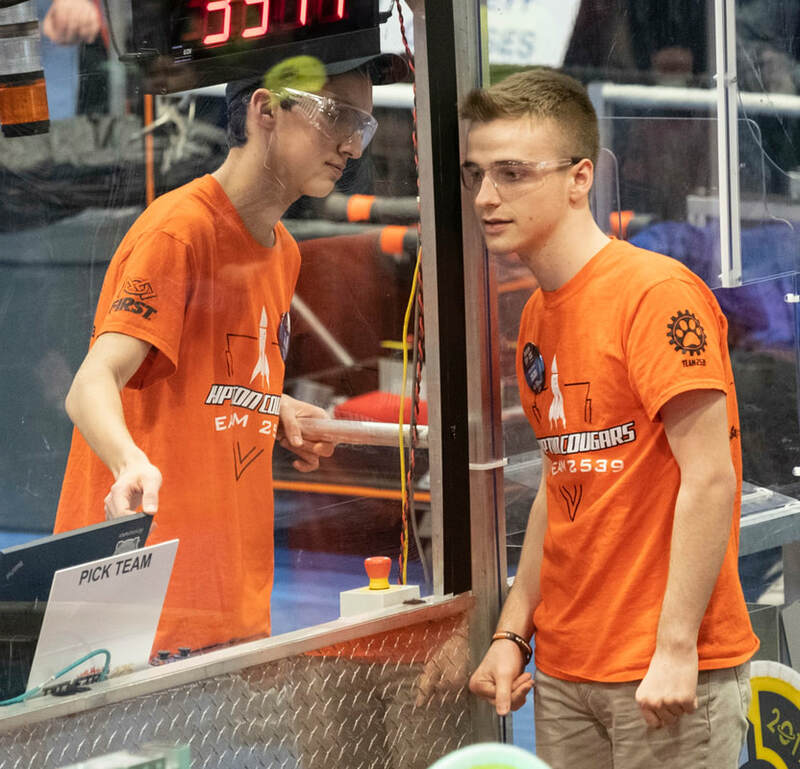 As soon as qualification matches had finished, Teams broke up into individual strategy Teams and went straight to communicating with other teams about alliance selection. Finishing as the #! Alliance Captain, they had the first pick. The Team representative entered onto the field and announced our selection. The Team's first pick was TechFire 225, from York, and then the second, was 2590, Direct Current. After lunch, the Krypton Cougars dove into the strategy behind the game. 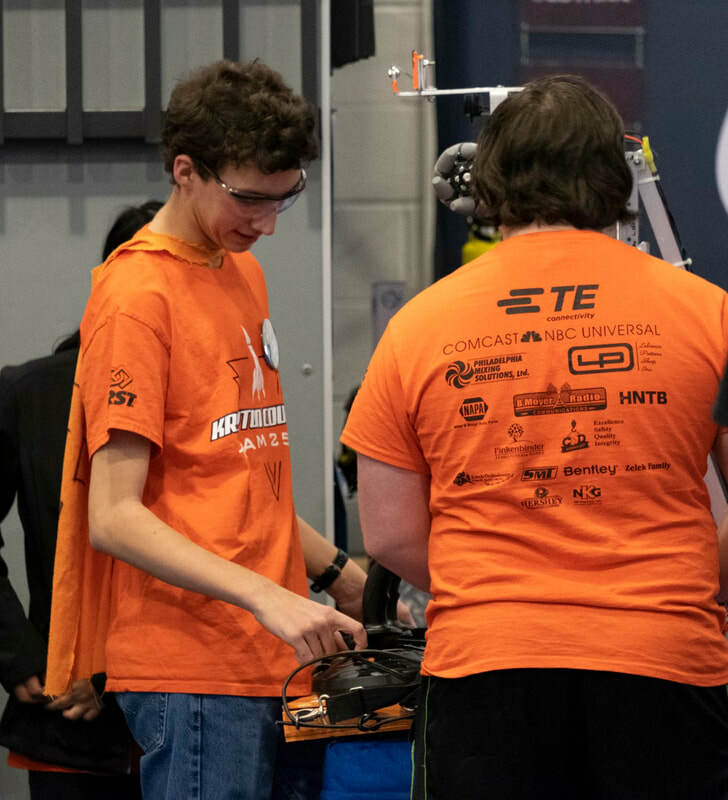 Once finished, the Team hustled over to their first Quarterfinals match, against the eighth alliance. They won both matches; the first with a score of 91-51, and the second by one point: 63-62. Team 2539 advanced into the semifinals. 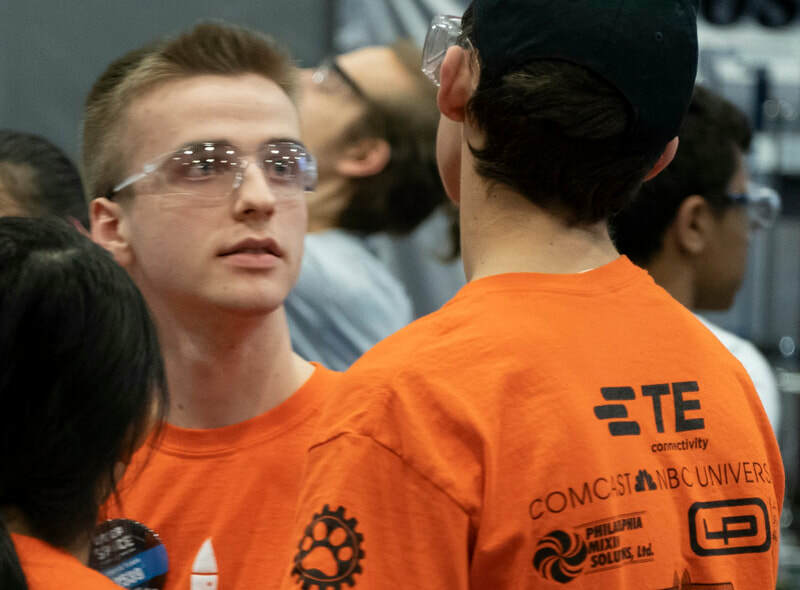 Unfortunately, though the Team's alliance partner 225 was faced with defensive maneuvers, causing the alliance to lose both matches, sending them home early. Although they came close to another blue banner, they still finished as the #1 Ranked Team. 2539 finished as the #1 alliance captain and ranked first. Both great accomplishments for the little team out of Central PA. The Krypton Cougars are proud to say that their journey through Deep Space does not end here. They will be heading to the MAR Regional Competition on April 3, 2019. 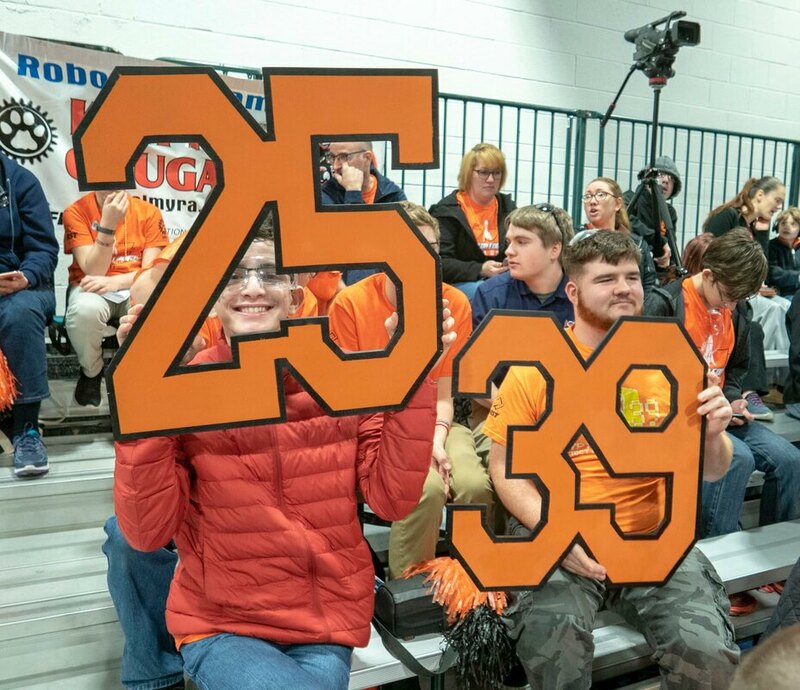 Team 2539 strongly believe that they have the potential to qualify and compete at the FIRST World Championships in Detroit Michigan on April 24 - 27. The Team had a fantastic season, and is so proud of all its members - student to sponsor to mentor.